Natu Kodi Pulusu: Natu kodi pulusu is a Andhra style chicken recipe which is cooked with a mix of desi spices. 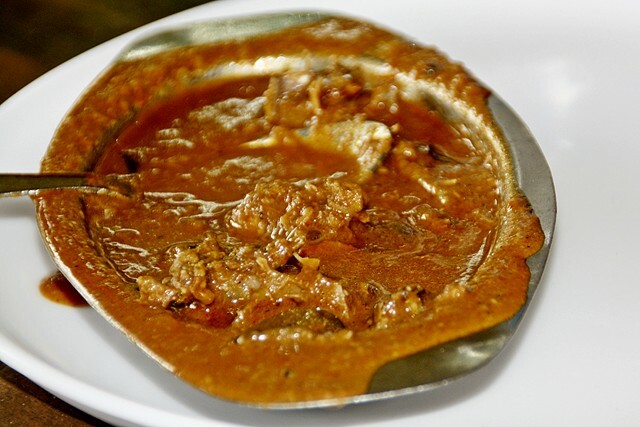 Like other foods of Andhra cuisine, natu kodi pulusu is also a spicy and delicious chicken dish. Natu Kodi literally means village chicken. Natu kodi pulusu is similar to the other Indian style preparation of chicken. Only the mix of spices makes the difference and the coconut adds a unique flavour to the dish. Dry roast the coriander seeds, cumin seeds, coconut and garlic together in a pan. Grind the dry roasted ingredients in a mixer, to a coarse paste with a little water. Fry the onions till they turn golden brown in colour. Then in add ginger-garlic paste, turmeric powder, red chilli powder and fry for 3-4 minutes. Add in the tomatoes, prepared paste, garam masala powder, yogurt and salt. Cook the mixture for 5-6 minutes. Now add in the chicken pieces. Cover and cook for 20 minutes or till the chicken is completely done, on low flame. Remove the lid and garnish with chopped coriander leaves. Natu kodi pulusu is ready to be served. Serve natu kodi pulusu with hot steamed rice. If you have any queries regarding the Natu Kodi Pulusu recipe, please leave a comment.